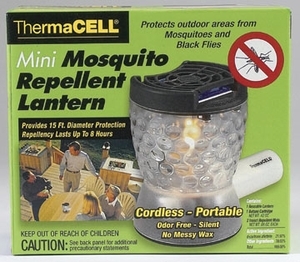 Outdoor enthusiasts can protect themselves from pesky mosquitos, black flies and no-see-ums, while bringing a soft glow to their campsite or patio. (Covers a 15x15' area). Each mini lantern includes one cartridge and 2 mats for up to 8 hours of protection. 4 AA batteries included.